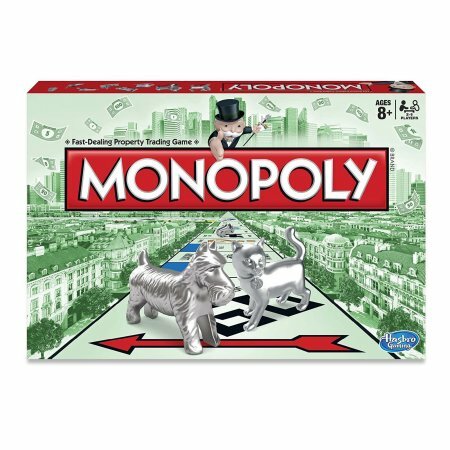 In the game of Monopoly, all players start out with a modest amount of play money from which they can begin to invest and build their property empire. As players move around the board over and over again, they buy properties, collect cash, and increase their wealth. The winner of the game is the player who has collected properties to the point at which they have monopolized the entire board. Players make property purchase decisions based on the amount they have to spend in the present to buy each property along with the amount they expect to receive in the future from the property. They attempt to maximize the amount of future cash they will collect from other players based on each $ of their play money they invest in the present. In Monopoly, there is both a positive-sum and zero-sum component of the game. Everyone gets $200 when they pass go, which is positive for everyone, as everyone gets richer as a result, and the monopoly "economy" grows. There is also a zero-sum component in that any cash collected from other players from properties keeps the total player wealth neutral but the cash changes possession. In order to monopolize the board, the zero-sum game is taken to the extreme and one player eventually holds all the wealth, at which point the game ends. There is a reason the game of Monopoly is called Monopoly. Capitalism is a game very similar to Monopoly. In capitalism however, most people start the game with almost nothing. In the game of capitalism, there are employees, firms (similar to Monopoly properties), and owners of firms and these groups of course aren't mutually exclusive. Employees work for firms, and firms generate cash for owners of firms- in some cases employees also own the firms they work for. Employees are therefore beholden to their firms and exchange their time/labor for cash, while firms are beholden to their owners and as an organization provide a product or service in the attempt to bring profit to their owners. People, generally investors, who understand the game of capitalism attempt to do exactly what players in Monopoly do- increase their wealth and accumulate assets- capitalism is just a much longer game than Monopoly is and most people don't know they are playing it. Along with being a much longer game than Monopoly, capitalism is also a much tougher game. Some people are given all the means necessary to do well, and some start with nothing. On average, nobody starts with much of anything and so everyone begins the game by working for a business to increase their wealth as all they have to offer at start are their personal skills and labor. A small percentage of the population in the game of capitalism either start their own businesses or buy existing ones in an attempt to grow their wealth. Similar to the game of Monopoly, those who maximize their future cash received from each dollar invested today are the most skilled capitalists and will accumulate assets faster than other players, growing rapidly and becoming the most wealthy players in the process. Some investors and business people have done this at such a high pace or over such a long time period (preferably both) that they end their lives with an enormous wealth and they generally own a historically large and successful company, or they own many companies in different industries. There are many examples that come to mind but it seems that the best players in this game have publicly acknowledged the game they are playing and planned decades in the future to maximize the assets they own. These players have started just like everyone else and gone from employees at one point, to buying small pieces of companies (or starting one from scratch), to eventually becoming the largest owners in the economy and owning large companies outright. Most players will never glimpse or even fathom this point as they either don't understand they are playing the game, do not care to play the game, or aren't very good at playing it (aren't good at maximizing future cash from cash invested now). Most players simply want to accumulate enough wealth to stop working for a company at some point and finally enjoy their lives. It also takes a very long time-frame and a lifetime of focus to become one of the most successful players in the game of capitalism and to become a large owner of companies. In capitalism, there are also positive-sum and zero-sum components to the game. Everyone gets richer as the economy grows and companies retain earnings- collective wealth and assets rise (although this wealth certainly isn't distributed equally among all players). To attain a return higher than average by investing however, you must access the zero-sum component of the game just like in Monopoly and exploit the mistakes of others in their investing decisions. To receive a return higher than average, another investor must receive a return lower than average. If nobody made mistakes and all businesses were priced rationally, nobody could exploit anybody else and everyone would receive the market average return, accumulating wealth at the same pace. This is not necessarily the case for entrepreneurs, who create businesses and new products instead of capitalizing on existing ones, but in many cases they take from older companies as they disrupt industries and affect existing companies. Entrepreneurs therefore generate new wealth while good investors mainly redistribute wealth from unskilled investors to themselves. In Monopoly, everyone starts by growing their wealth at a good pace but as players eventually collide certain players must mortgage or sell off their properties and their wealth declines as a result of mistakes they have made or just being unlucky and having to pay other players. When you mortgage or sell off a property in Monopoly, you not only lose your current wealth, but also your ability to generate income which hurts your future wealth even more. In capitalism, any loss of wealth is a huge mistake which can set a player back years and can be the result of just one poor investment. Just like mortgaging or selling a property in Monopoly, your wealth drops and your ability to create wealth drops- since as an investor you need money to make money. The more money you have, the more money you can make as an investor- this is the general principle of compounding and so your income grows as your wealth grows- this is why wealth grows at an exponential/accelerating pace, not a constant/linear pace. This is why the most important thing is to avoid this at all costs- generally with a proper understanding of one's investments and a certain mindset of aggressive conservatism- the desire to compound at the highest rate possible while ensuring the protection of your current wealth and remaining within your boundary of knowledge and understanding. Once you see capitalism as a game, you can understand why public companies go to no end to please their owners, provide consistent guidance to Wall Street and attempt to meet quarterly objectives (it isn't to provide a better product/service to their customers). You can understand why companies lobby our government in an attempt to change the rules of the game to benefit themselves or why owners collide with employees as they argue over the distribution of wealth they create. You can see why greed and misunderstanding in the financial sector spawn crises on a cyclical basis which leads to opportunity for others willing to take it. You can understand how mispricing of public companies can happen as some unskilled players make mistakes in buying/selling stocks, and why certain investors would dedicate their lives to exploiting these mistakes for a much higher future return than could be obtained from a market average. Seeing the game of capitalism for what it is is the first step towards understanding how to play it properly and it brings the proper long-term planning and asset accumulation mindset necessary to become one of the most successful players of the game.